Everything seemed pretty dire for the Florida Gators on Monday when head football coach Jim McElwain, while going through his injury updates, wound up noting that five of the team’s seven defensive front seven players were either injured or out for the game. While that has not exactly changed, McElwain on Wednesday night was much more bullish about the players’ ability to play in Saturday’s game against the LSU Tigers. 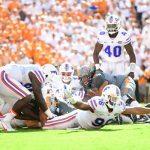 McElwain said redshirt junior defensive tackle Caleb Brantley (illness, hand) has been upgraded from questionable at best to able to play while being “wrapped up pretty good.” Redshirt senior defensive end Bryan Cox Jr. (undisclosed) has improved from “limited” to “fine” and doing whatever he can to see the field. Previously, McElwain said senior linebackers Alex Anzalone (hand in a splint) and Daniel McMillian (ankle) will be playing. Updating players surely out for the contest, McElwain confirmed senior DT Joey Ivie (thumb) will be out for a couple more weeks, while redshirt junior DE Jordan Sherit (knee) had successful arthroscopic surgery. Onto the offensive side of the ball, redshirt sophomore quarterback Luke Del Rio supposedly split reps evenly with graduate transfer Austin Appleby in practice. Though Del Rio experienced some stiffness, “he will be prepared to play.” The expectation is that Del Rio will start and play in the contest. “I thought he was playing at a pretty high level. 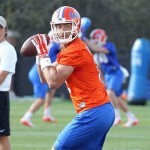 He was pretty on time with some things,” McElwain said of Del Rio’s first few games. There was also the possibility that Florida could be without junior offensive lineman David Sharpe (shoulder), though McElwain said he will be “fighting through” the injury in an attempt to play. For LSU, running back Leonard Fournette is not expected to play. “It doesn’t look like,” he will be healthy enough, interim coach Ed Orgeron told the media on Wednesday. Should Fournette find the bench, backup Derrius Guice would see the vast majority of the carries. Guice is no slouch either as he just rattled off 17 carries for 163 yards and three touchdowns against Missouri last Saturday. After their high school crap. Learn to man up an play or sit down and whine…and get your team a new face BC half the state is a shamed of you all.